To create the custom linetype, let’s start with the rules in customization. 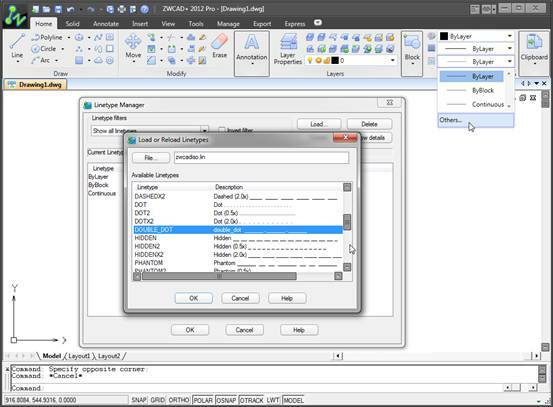 In the ZWCAD, we can find a zwcad.lin file in C:\Users\[username]\AppData\Roaming\ZWSoft\ZWCAD\2012\en-US\Support . 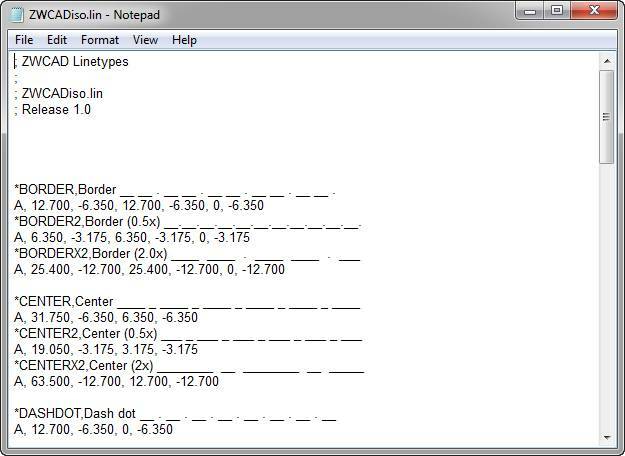 Open the file by Notepad, and the linetypes provided by CAD have been listed. *BORDER,Border __ __ . __ __ . __ __ . __ __ . __ __ . The linetype definition is composed of two parts. The first part is name and description for the particular line. Start the definition with “*”, then we could name the line. Leave a simple description after the comma. Specify the codes of lines in the second part. “A “ stands for alignment. The first parameter value should be equal to or more than “0”. The second parameter value should be less than “0”. Positive value means drawing a straight line with certain length. “0” means draw a point. Negative value means space. The punctuation after codes should be input with half-width. Let’s take the center line as an example. The source code for which is A,1.250,-0.25,0.25,-0.25，According to the definition rules stated above, it means drawing a line with length of 1.25, ‘-0.25’ means a space with length of 0.25, ‘0.25’ means a line with length of 0.25. If you are still not so clear about how to customize the linetype, you could draw the line first. Here is an example for double dot dash line. Let’s see how it’s defined. Save the file after we add the source code. With the same method, we could customize the linetype in design.